Gibson Stainless & Specialty, Inc. has been a premier providerfor the electrical and other industries since pioneering stainless steel electrical systems over 20 years ago. With a focus on American manufacturing, we proudly provide electrical conduit and fittings that meet and exceed industry standards; many of these products are UL Listed. Our customers benefit from the high inventory we maintain as we ship over 90% of our orders complete within 24 hours. Gibson Stainless & Specialty, Inc. is an American company, 100% American owned. From the very beginning, we have used castings from American foundries, steel from American mills, and manufacturing processes right here at Gibson Stainless. Today, most of our products are either 100% Made in USA or Manufactured in USA. We are dedicated to quality and transparency across all of our work. If there is an imported product in our line, we will tell you it’s an import! 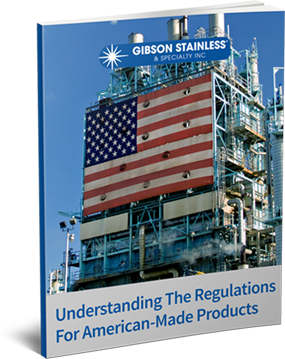 Our eBook helps to provide information on American regulations and American-made products.